It's almost and nearly Easter! Even though I won't have time to celebrate it myself, I got really excited about baking something Easter from another country. A little bit of research showed me that during Easter the most traditional food is bread. Every country seems to have it's own Easter bread or buns. In the Netherlands we have the Easter Bread, in America and the UK you've got Hot cross buns and in Italy there's Colomba di Pasqua! Oh yes, I know the Dutch Easter bread is exactly the same as the Dutch Christmas bread. We use the exact same bread for both occasions! We sometimes variate the topping to fool ourselves (snow-like sugar for Christmas and almonds for Easter). And it's the exact same for the Italians! 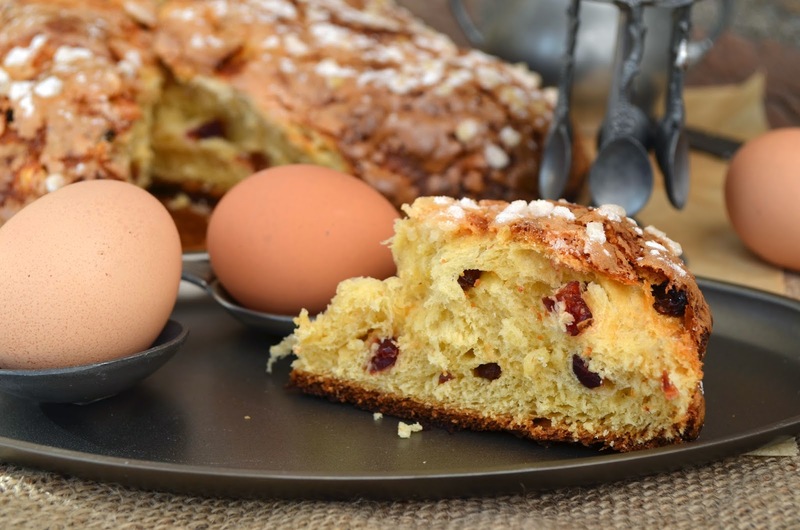 Have you ever tasted the delicious fluffy Panettone? It's a sweet bread the Italians get to enjoy around Christmas and New Year. 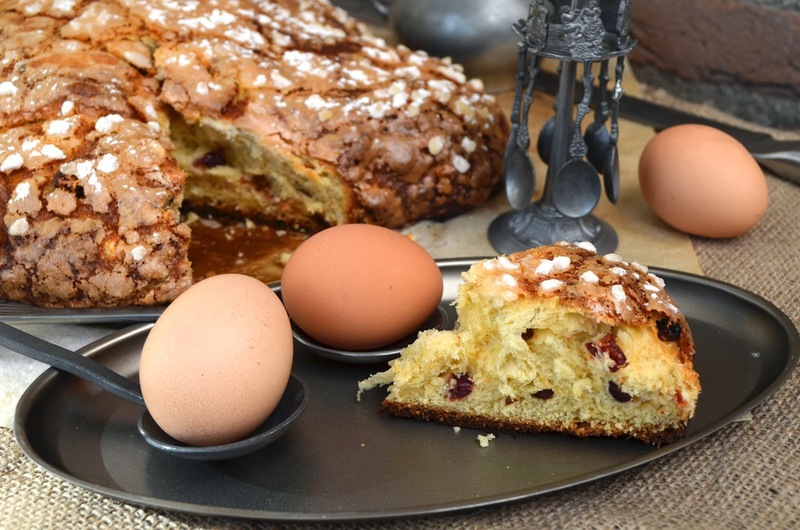 Colomba di Pasqua is the Easter version of Panettone. It's the same, but just comes in a different shape and with a different topping. 1. Add the yeast to the milk and mix until dissolved. 2. Add the flour and stir. Leave your starter to rise overnight. 3. Beat the eggs with the sugar, salt, vanilla and lemon zest. 4. Add the butter and the starter and mix again. 5. Lastly, mix in the flour and knead until you have a smooth and elastic dough. Add the dried fruits while you are kneading. Then leave to rise for about 2 hours. 6. Once the dough has risen, divide the dough into 2 equal parts. Shape the dough into the shape of a dove (Start by making the wings: one fat cylinder, slightly flattened. Flatten some more in the middle of the wings and put the body on top: one long cylinder. It might look a bit like an uneven cross). Leave to rise for another 45-60 minutes until doubled in size. 7. Grind the almonds if necessary. Add the sugar, cornstarch and eggwhite to the almonds and mix to form a paste. 8. When the dough is done rising, spread the almond-paste over the top of the bread. Sprinkle the almonds or sugar pearls on top. Sift powdered sugar on top. Leave for 5 minutes, then sift more powdered sugar on top. This gives the cracked effect on top of the bread. 9. Put in a preheated oven of 190 Celsius or 370 degrees Fahrenheit for 15 minutes. After those 15 minutes reduce the heat to 175 Celsius or 350 Fahrenheit and bake for another 20 minutes. Cover the bread in aluminium foil if the top turns too dark before the baking time is over. 10. Leave to cool before serving. * Recommended and most traditional: candied orange peel and raisins. I didn't actually realize this bread was going to be exactly like Panettone until I cut it. Can you imagine my delighted surprise once I cut into what I thought was a bread and found out it was fluffier than a cake? 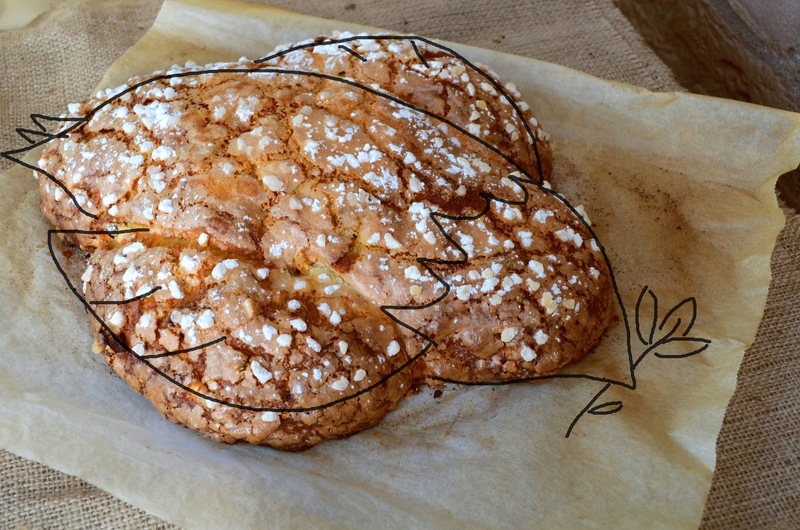 Since it was such a large loaf, I froze half of the Colomba di Pasqua straight away to eat it on actual Easter. The rest of the bread? It was gone in a day! And I wasn't the only one nomming it! - Once the bread has cooled cover it with melted chocolate or nutella, zigzag a white chocolate pattern or sprinkle sugar pearls on top (preferably all three). I really hope you have a lovely Easter! I won't be sharing a lot of Easter traditions with you this year, but I will be sharing two lovely -traditional!- breads to enjoy! I'll be around for a few more years at least, so I'll just have to make sure to enlighten you on how people celebrate Easter next year. Please survive one more Easter without knowing whether the Chinese hide Easter eggs or not! It is, it is! I wish I could've given you a piece just to show you the sweet, soft fluffiness.. Oh, I could go on about this forever to be honest.. I just love the softness of breads. The addition of sugar and raisins makes me fangirl all the way!